Are you up to buy a new fireplace for your cozy home? Yeah Winter is Coming and there is nothing like a warm fireplace in home with the classic view of wooden logs burning inside… but you are confused between classic that is traditional or a modern contemporary wood stoves? Let us break things down for you. A traditional fireplace will burn the logs of various varieties of woods and get you the necessary heat for your home. Whereas modern stoves will create an ambiance like wood burning stoves with the use of Wood, Gas, oil or any other flammable product in the market. There are still some points that need to be considered while choosing a nice fireplace for your homes. A beautifully designed fireplace with stones looks elegant in a living room. A masonry fireplace has a number of possibilities while designing like mosaic tiles, stacked stones, brickwork, veneer or even marble. Open view of fire flames and the incomparable appearance, feel and smell of burning wood in a fireplace makes this classic style of fireplace among many people. Since classic fireplaces provide this feel on the other hand, a wood stove will have a glass door and it will lack this smell and elegance. Any fireplace appliance featuring a wood burning fire can come with natural safety challenges. As gas or pellet fuel is clean and safe, byproducts and creosote from burning wood can accumulate in chimney, posing a serious chimney fire if not taken care properly. Sparks coming from wood fires is another issue. Sparks are easily spread out of fireplaces causing injuries or even property damage. Installing proper covers in the forms of glass doors to fireplaces can help ensure that sparks won’t come out of the place to furniture or carpets in your homes. Wood stoves on the other side are already equipped with glass doors since they feature the closed combustion unit that means no spark flying around your living room. An open burning fireplace is a potential hazard for children and pets. Wood stoves are much safer in this respect since fire is not directly exposed in the open, but there still is a minute risk of someone getting burned if they touch the glass door of the stove. Safety gates and glass doors are the great ways to keep your little ones wandering with their furry friends around the living room. It’s a known fact that wood is the lowest expensive fuel type compared to gas, pallet, oil and coal etc. although cheap as fuel it is, wood fireplaces are not the efficient fire equipment in the market. In fact, they tend to be the least efficient heat source with a heat efficiency of 10% only. The biggest part of the heat gets vanished through chimneys, leaving the room less warm than it should be. On the other hand; wood burning stoves can provide 300% more heat with 1/3rd of the firewood which places them on the efficient side. When it comes to efficiency, wood burning stoves win. Burning a wood releases no more CO2 than a tree does while decaying itself naturally in forests, which means Burning Wood, is Carbon Neutral. The wood stoves today, are equipped with closed combustion system which means, they produce a very little amount of emission. That being said, they are more efficient and better at providing heat, wood stoves can help supplement your current heating system, allowing you to lower your utility during the cold winters. When it comes to heating appliances, it up to your choice what you prefer, whether a Traditional one or a Modern one. If aesthetics, ambiance and authenticity have their places in the corner of your minds, go for a wood fireplace. 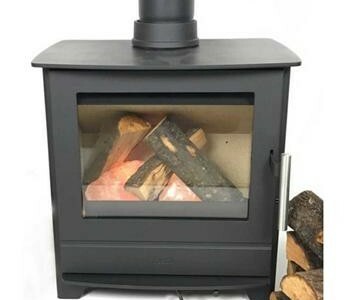 If you desire a highly efficient heating powerhouse together with ambiance and modern elegance, a wood burning stove would be a great choice for you.